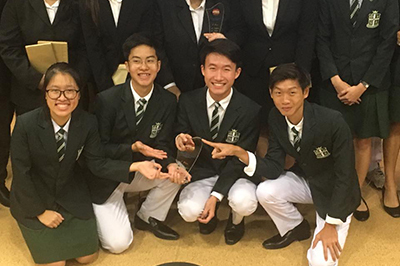 Singapore’s team Chaleur won the Global Final of ‘Social Innovation Relay’ with a question-and-answer platform called INTuition which provides free academic guidance to students. This platform is specifically targeted for students and relies on the goodwill and passion of students to pass on knowledge, to have meaningful discussions which enrich their academic lives. This allows for students to excel in school and life regardless of their financial background. After qualifying in their country, team Chaleur competed for the global title against student teams from across the world. This 7th edition involved more than 10,000 students across 10 countries: Bulgaria, Czech Republic, Greece, Hungary, Japan, Netherlands, Poland, Romania, Singapore, and Spain. “We are very honoured to have been selected as the global winner in this exciting competition. The journey was demanding and challenging at times, however, the overall experience was extremely rewarding and we are definitely grateful to have had this opportunity to compete with the other local and international teams. Thank you Junior Achievement, and thank you all who took part in this year's Social Innovation Relay! We will endeavour to use what we have gained from this journey to benefit and bless our community,” said team Chaleur. The Social Innovation Relay (SIR) is a global competition organised in collaboration with NN Group that challenges secondary school students to develop an innovative business concept that addresses a social need. The participating teams are paired with NN mentors who connect with the best 20 teams in each participating country, to help them develop concept papers that can translate into feasible business ideas. Together with NN, JA Europe seeks to increase students’ self-confidence, empowering them to get creative and find solutions to both local and global social needs in the following sectors: education, health, social inclusion, livelihood development, and sustainability. “At NN Group we are committed to empowering young people, and we can see the results of our efforts through the Junior Achievements’ Social Innovation Relay. This year’s finalists were all very impressive, and I am inspired by their passion to bring constructive change to their communities through innovative, social business plans. These students show that you can truly have a positive impact even at a young age. Many congratulations to all!” Fleur Hudig, Head of Corporate Citizenship, NN Group. JA Europe’s Social Innovation Relay, has brought some outstanding talents to the global stage. In 2016, social innovators from Romania took first place. Oculus, a students’ team helping the visually impaired to become more independent in their movement continued to positively change the world even after SIR. In 2017, they took home the main prize at the AmCham Youth Entrepreneurship award. This prize consisted of a cash prize of 10,000€ and a mentoring programme with European CEO'. “It is great that teams prepared projects in a wide variety of fields. There were projects aimed at education, environment, vulnerable groups. Some teams via their projects showed their talents and skills. However, the others focused on solutions to challenges faced by our society. For me, as Member of the European Parliament, being part of the jury was a great experience. I learned a lot from these young people and I am impressed by their engagement, energy and innovative approach!" said Danuta Jazłowiecka, Member of the European Parliament.